In many ways, the past year has been a brutal one for climate advocates. Our country pulled out of a global commitment to reduce emissions; landmark achievements such as the Clean Power Plan remain stalled; and Americans endured 15 $1-billion extreme weather disasters. Amid that struggle, many climate champions look to Miami as a beacon of hope: leaders who recognize of the realities of climate science; counties coming together to plan for a warmer, wetter world; and groups like ours ensuring any resilient future is also equitable, inclusive and fair. Despite these positive achievements, Miami still hasn’t come to terms with how it’s going to pay for a climate-resilient future. It’s time to start asking climate polluters — the oil, gas and power companies whose products contributed most to climate change — to pay their fair share of climate costs. Last fall, Miamians voted to tax themselves to cover $192 million (likely a mere down payment) for projects to prevent sea level rise and flooding. Miami Beach has already spent half a billion dollars to improve stormwater infrastructure. For too long, residents have borne these costs alone. That has to change. 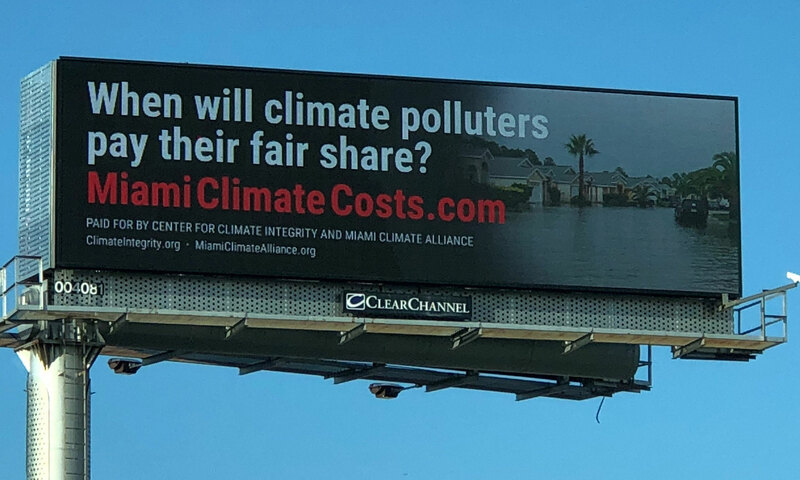 That’s why, as part of Miami Climate Alliance, we’re joining on to the local Pay Up Climate Polluters campaign. The campaign is asking county and city leaders: When will we start to hold these companies, including Florida utilities, accountable? Nonprofit and academic reports show that oil, gas and power companies (including some that operate in Florida) knew that burning fossil fuels would lead to climate change as early as the 1970s. Instead of leading the transition to clean energy, they sowed doubt about scientific realities and downplayed risks. FPL might have withdrawn their request for a rate hike post Irma (they had originally asked for $1.3 billion), we but all know they have been passing hurricane-related repairs onto ratepayers going back to Matthew. Climate change doesn’t cause hurricanes, but it amplifies the damage they cause. So while they obstruct the transition to clean energy sources, they pass to us costs driven higher by their products. It doesn’t make sense. It’s not fair, and it must change. That’s why we’re asking leaders to explore ways to hold companies that contributed most to climate change accountable. Otherwise, we know that these costs, like climate impacts, will fall disproportionately on the low-income and communities of color who contributed least to the problem. Perhaps Miami — like New York, San Francisco and Oakland — should file a climate damages lawsuit to hold climate polluters liable for the billions it will require to keep our communities safe. Right now, we’d be thrilled to have a candid discussion about what staying safe will cost us, and who’s going to help us pay.